› Author Affiliations Funding This study was funded by the Swedish Research Council VR 2015–02517, Swedish Society of Medicine SLS-500111, Swedish Research Council 522–2010–2823, Sahlgrenska University Hospital ALF research grant ALFGBG 622301, Stiftelsen Sigurd och Elsa Goljes Minne LA2017–0197 and Sahlgrenska University Hospital Research Grants 90170–8181. Endothelial expression of tissue-type plasminogen activator (t-PA) is crucial for maintaining an adequate endogenous fibrinolysis. It is unknown how endothelial t-PA expression and fibrinolysis are affected by blood flow in vivo. In this study, we investigated the impact of different blood flow profiles on endothelial t-PA expression and fibrinolysis in the arterial vasculature. Induction of disturbed laminar blood flow (D-flow) in the mouse carotid artery potently reduced endothelial t-PA messenger ribonucleic acid and protein expression, and caused fibrin deposition. En face immunohistochemistry demonstrated that arterial areas naturally exposed to D-flow had markedly lower endothelial t-PA levels than areas with sustained laminar blood flow (S-flow), and displayed pronounced fibrin deposition despite an intact endothelium. In t-PA and plasminogen-deficient mice, fibrin deposition did not extend into S-flow areas, indicating that areas of D-flow and S-flow differ, not only in fibrinolytic capacity, but also in coagulation. 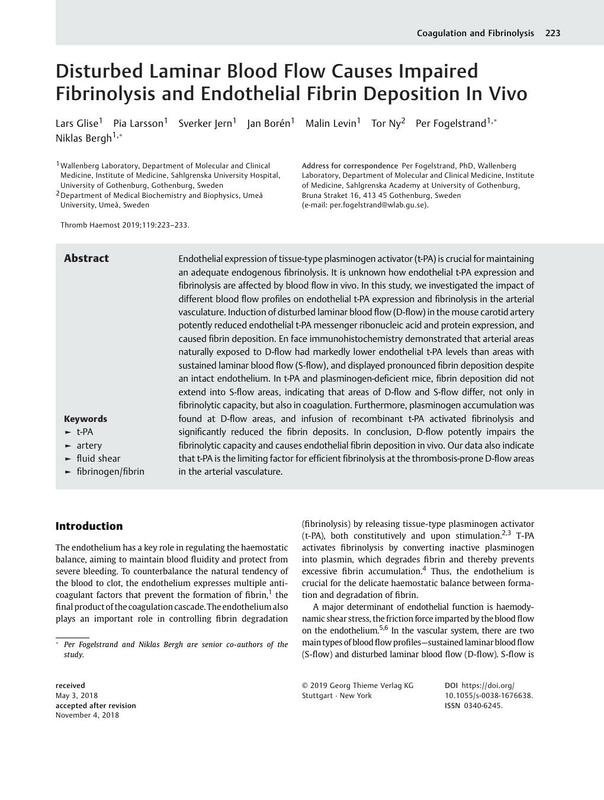 Furthermore, plasminogen accumulation was found at D-flow areas, and infusion of recombinant t-PA activated fibrinolysis and significantly reduced the fibrin deposits. In conclusion, D-flow potently impairs the fibrinolytic capacity and causes endothelial fibrin deposition in vivo. Our data also indicate that t-PA is the limiting factor for efficient fibrinolysis at the thrombosis-prone D-flow areas in the arterial vasculature. * Per Fogelstrand and Niklas Bergh are senior co-authors of the study.